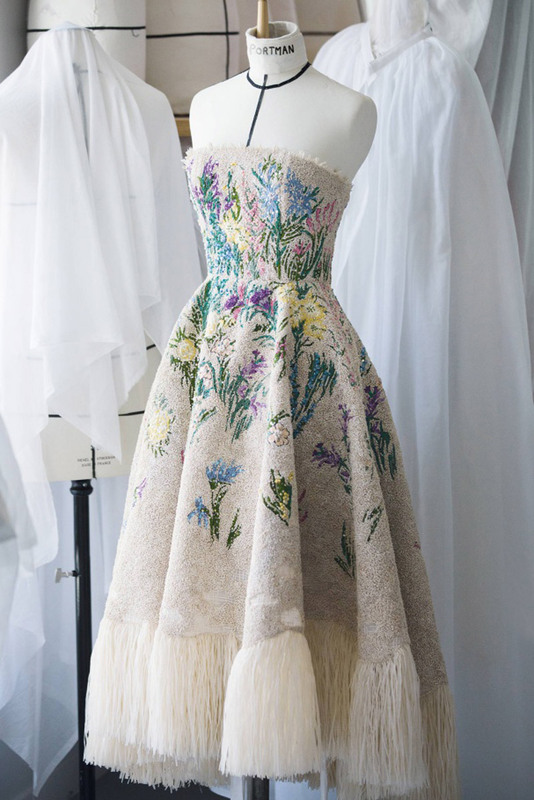 The spirit of Dior couture has been prevalent in Miss Dior since its inception in 1947, written into its history like the lines of the iconic bottle, which is “cut like a suit.” Always inspiring the most daring interpretations, the Miss Dior bow is transformed once again, with a floral embroidery inspired by the Essence d’Herbier haute couture dress, designed by Maria Grazia Chiuri with an echo of the Miss Dior dress created by Christ ian Dior for his spring-summer 1948 collection, evokes an armful of meadow flowers. 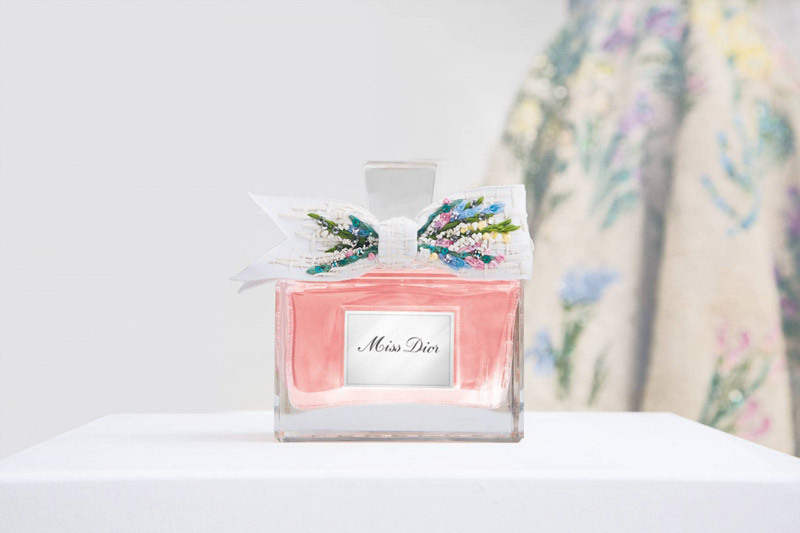 Worn by Natalie Portman in the latest images of the Miss Dior campaign, it references Christian Dior’s passion for gardens and the floral bouquet that composes the perfume. Thus, the double satin bow was embellished with an embroidery of raffia which has been previously dyed and then dried. Each strand was then divided into four to craft a base of loops of these fragile raffia threads that was then meticulously covered by needle with blue, yellow, pink, and acid green glass beads. This undertaking is carried out by expert hands that produce a precious and strikingly modern bow. 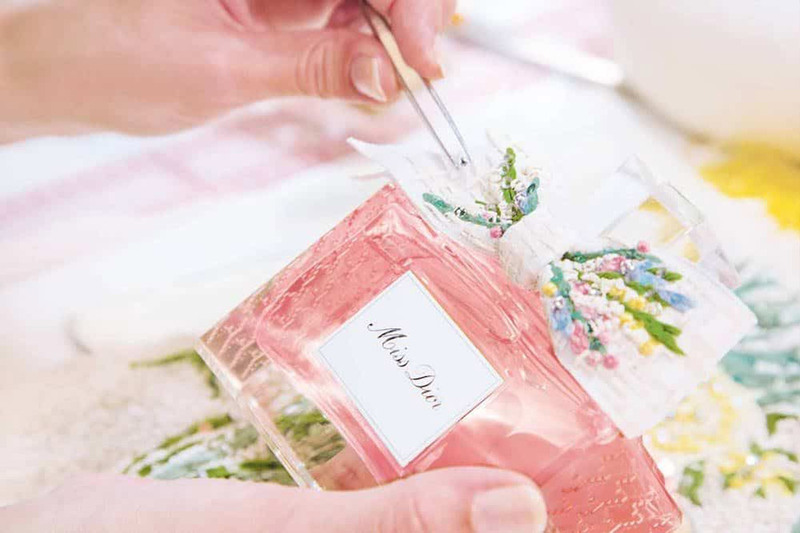 In tribute to the dress, from dress to bottle, Miss Dior is the House’s eternal perfume. Only 47 pieces are available worldwide, celebrating the year Miss Dior was first introduced: 1947. Each piece is hand-crafted in the fruit of extraordinary creativity, and a craftsmanship that has been lovingly preserved.